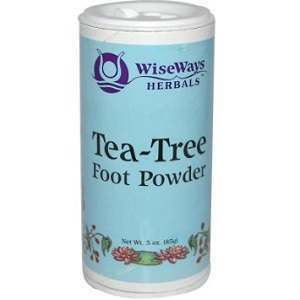 This is a review of Tea-Tree Foot Powder which is manufactured by Wise Ways Herbals. This product claims to heal athlete’s foot and other fungal infections and rashes. Read on to learn whether Tea-Tree Foot powder is right for you and your symptoms. Calendula flowers are traditionally used to prevent muscle spasm. They are also used to treat wounds and ulcers that are not healing properly. Arrowroot is a traditional remedy for diarrhea and abdominal pain. It is a starch that is also used in cooking. Cornstarch is a traditional treatment for diaper rash. Sea salt is said to encourage dental health, relief from arthritis and relief from psoriasis. It is also said to promote good skin care. Tea Tree oil is commonly used to cure a variety of diseases and skin afflictions. Sage oil is said to help people deal with depression. It is also said to stimulate the lymphatic system. It might treat dermatitis as well as sores and wounds. Cypress oil is said to have astringent, antiseptic and antispasmodic properties. It is used for curing spasms, strengthening gums, promoting health and as a sedative. The manufacturer does not list the label or directions for use on their website. However, the ‘Label Directions’ on Amazon suggest that one should apply the product to the affected area liberally. Calendula is not safe for oral consumption for women who are pregnant as there is concern that it may cause miscarriages. Little is known about the safety of use while breastfeeding. People who are allergic to ragweed plants may find that they suffer an allergic reaction to calendula. Sage oil should not be used by anyone who is pregnant or breastfeeding. It should also not be used by anyone who has epilepsy or high blood pressure. Sage oil can be very toxic and should be used only as instructed to avoid high concentrations. Overdosing on sage oil can result in convulsions. Cypress oil has few warnings other than that it must be avoided by women who are pregnant. The manufacturer lists Tea-Tree Foot Powder for sale at $6.50 without shipping and handling. It is listed at $15.13 plus $8.99 on shipping and handling on Amazon. There is no guarantee listed for this product by retailers or the manufacturers. Any unopened and unused products may be returned for a refund within 30 days of receipt. There are no reviews available for this product to determine its efficacy. Wise Ways Herbals manufactures a natural therapy for fungal diseases such as athlete’s foot. Many of the ingredients are traditional kitchen ingredients and while some act as an antiseptic, it is not known which of the ingredients acts as an anti-fungal. The price discrepancy between the retailers and the manufacturer is quite large and Wise Ways Herbals will not provide a refund if Tea-Tree Foot Powder is not right for you. Jimmy Rodriguez	reviewed Wise Ways Herbals Tea-Tree Foot Powder	on June 10th	 and gave it a rating of 3.